When you contact Automated Cleaning Technologies (ACT) to discuss industrial parts cleaning or processing systems, our priority begins with addressing your needs. Our dedicated engineering team and fabrication team will work with you to evaluate your entire process and develop solutions that incorporate the latest advances in machine and process design, including custom programming. We offer worldwide turnkey support, providing on-site system installation, training and certification of your staff, and on-site maintenance services. We offer integrated, process-specific hardware and custom programming with a full range of automation solutions, from single piece robotic to batch transfer with data logging. ACT specializes in designing and integrating material handling, automated load transfer, and robotic pick and place systems within your structural parameters and space. Our ECO-AUTOCLEAN industrial parts washers and cleaning systems are designed to enhance worker safety and protect the environment and your parts. 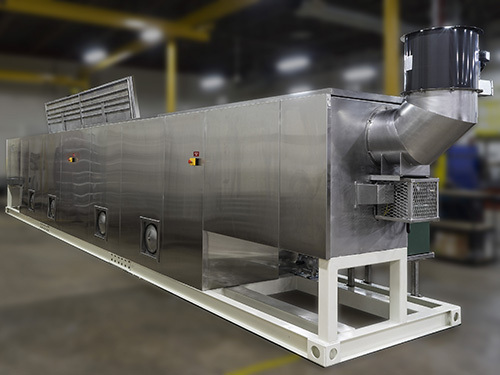 Our spray or immersion cleaning systems use high-efficiency closed-loop recycling during cleaning conserves water and helps minimize waste generation. Our automated aqueous industrial parts cleaners use mild detergents and do not rely on hazardous chemicals or produce any VOCs during washing operations. Hands-free, consistent processing is best done in an ACT machine! Our ECO-CLEAN wastewater evaporators help customers safely minimize their waste streams without producing VOCs. Our units are designed for maximum heater efficiency and safety with built-in redundancies. Typical liquid waste stream reduction of 90+% can be realized, resulting in an amazing return on investment figures vs. hauling away liquid wastes. We offer several unit sizes to choose from and we will engineer your system to suit your waste profile. We work regularly with Fortune 500 companies, the United States military, and numerous successful companies from around the world. We serve a broad spectrum of industries, including aviation, automotive, construction, oil and gas, manufacturing, mining, military, pharmaceutical and power. New manufacturing, MRO, and remanufacturing in these fields see the bulk of our systems in service. Our professional capabilities extend beyond producing industrial parts cleaners. We engineer and manufacture a broad range of industrial systems and provide full-service in-house fabrication/prototype production capabilities and exemplary support services that can include total project management and turnkey integration. Read more about what we do and contact us today to talk to an experienced ACT sales engineer to get started. Current customers can log in to access their dedicated online resources here. Automated Cleaning Technologies offers a wide array of automated solutions to meet the specific cleaning and finishing needs of our clients. We engineer and manufacture cleaning systems that are programmable for unique applications, equipped with robotic transport for safer operation and minimal risk to parts and personnel. ACT engineers and manufactures complete systems for manual, semi-automated or automated applications, so you may choose the level of automation that works for you and the task at hand. From military aircraft and weapons systems to high-tech machinery, modern components are designed with exacting details and dimensions that demand an equal level of precision for their care and maintenance. Efficient and thorough cleaning of parts with such intricate internal geometry is accomplished via cleaning systems that are engineered to direct just the right amount of soil lifting technologies via aqueous and /or solvent liquid pressure or hydraulic flushing, inside and out. ACT makes this possible by providing constantly changing flow patterns to insure that even hard to reach areas are thoroughly cleaned. Grease and grit and other contaminants often lodge deep within components, resistant to manual cleaning techniques. By engineering a cleaning system with precise pressures and exacting technologies and engineered fixtures, ACT guarantees that soft metal parts are cleaned through and through, and safeguarded from damage. Additionally, automated processing saves both time and labor in the cleaning of your production or remanufactured parts. Automation can not only minimize the risk of damage to parts, it also provides a safer working environment for operators. Parts can remain stationary throughout the automated cleaning process, while the system works around them to get the job done. Alternately, your cleaning system may be engineered for robotic transport, or automatic load transfer. At each stage of the cleaning process, your parts will be positioned precisely where they need to be for fast and efficient cleaning. As the complexity of our clients’ products increases, so must the technology and innovation of the automated cleaning solutions we offer. At Automated Cleaning Technologies, we continue to engineer and manufacture cleaning systems that will deliver the reliability and efficiency that each client expects, and that each application demands. PLC (Programmable Logic Controller) systems will store multiple recipes for adjusting parameters automatically so that a single cleaning system can be quickly configured for a variety of parts. Our engineers consult with each client to identify their specific needs and design a system that is ideally suitable both functionally and economically. Get the automation level of your choice, realize significant savings in production costs per part, labour, and time while enhancing safety in your work environment. Contact ACT and see how we can help improve your ROI with our unique and application specific ultrasonic cleaning systems (LINK TO NEWS POST). Have tough internal cavities? Ask about how our Bi-Directional High Pressure Flush Cleaning system can increase the thoroughness of your precision parts cleaning. Call us today and discover the cost-savings and reliability of automated cleaning. That’s what we’re all about at ACT.